This is a rare piece of Chinese history. 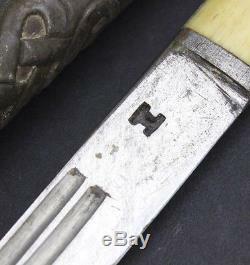 17-18 th century Travel dagger contains a very sharp steel blade dagger with bone and wood handle. 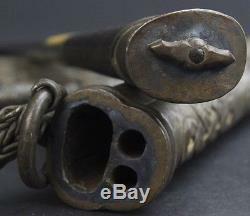 Silver hilt with Infinity knot decoration. Sheath has knot decoration and room for a pair of chopsticks. Woven silver chain has a large counterweight further decorated with the same knot design. Stunning piece for the collector. Unmarked, x-ray verified silver content. Sheath measures 11 1/2 long. 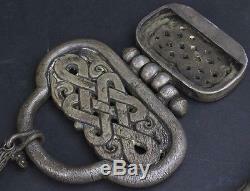 Pendant measures 5 1/2" x 4 1/2" Total weight approximately 926 grams not including dagger. 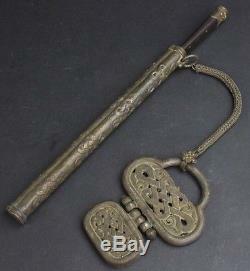 Wear to case and dagger in keeping with age. Please see photos as part of the description. 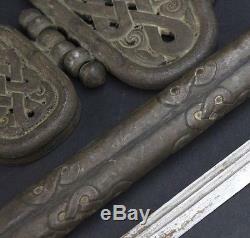 The item "Rare Antique Chinese Fine Silver Traveller Dagger Knife Sword With Counterweight" is in sale since Tuesday, June 07, 2016. 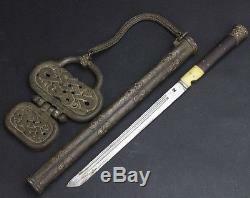 This item is in the category "Antiques\Asian Antiques\China\Swords".